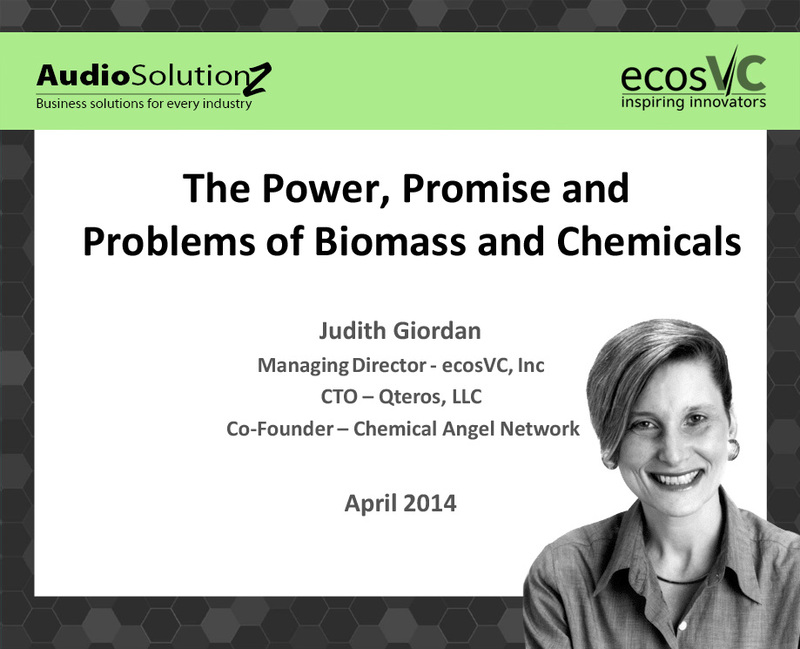 Judy Giordan presented a webinar for AudioSolutionz entitled The Power, Promise and Problems of Biomass and Chemicals. Biomass has spelled hope and frustration for enabling cleaner energy, delivering a promise for greener products and creating a growing economy. Start-ups abound, Fortune 100 companies are lining up to commit to cleaner products, but with venture firms pulling out of the financing mix, there are few dollars available for actual scale and change over. Biomass is seen by some as the most viable source of alternative energy, but with venture capital virtually drying up, this promising solution for cleaner, greener energy is getting farther beyond our grasp. There are few dollars available for the scale and cross-over needed for Cleantech to really make its mark. Start-ups are struggling to survive in this challenging environment, while the Fortune 100 wonder what their role should be. The energy market, however, isn’t the first to face such a plight. Pharmaceuticals once struggled under a similar scenario, but have emerged victorious by rethinking their strategy. Today, mainstream Pharma has embraced the need for a pipeline of new ideas and products and is working to move away from the “not invented here” syndrome that plagued them and lost market cap and confidence in their companies. Will this trend take root in chemical, materials and energy companies as we seek to move to a mixed feedstock source of biomass and petro-based energy? Or will “not invented here”, cheap natural gas, and fracking keep the promise of biomass at bay? Is this a US trend or a global one? And is the US going to miss out on this new wave of materials based on new sources of petro-intensive feed-stocks? Purchase a dvd, transcript, or both here at AudioSolutionz. ACS Webinar, November 1, 2012. Joseph Steig moderates. "Valuations, term sheets, tranches, waterfall, etc. You learned the language of chemistry, now it is time to learn the language of investing. The experts are here to help!" * Past ACS Webinars are only viewable by ACS members, login to watch! ACS Webinar, October 4, 2012. Judy Giordan moderates. "Like to develop your entrepreneurial spirit with the resources of a large corporation? Learn how you can be the change agent in your corporation!" CSMC Webinar, September 20, 2012. Judy Giordan moderates. ACS Webinar, September 6, 2012. Joseph Steig moderates. "Raising money is the easy part. Anyone can raise ‘fool’s money’. Raising ‘smart money’, that’s the trick. Make sure you know the difference!" ACS Live Webinar, August 30, 2012. Judy Giordan as speaker. During the ACS National Meeting in Philadelphia in August 2012 Judy was featured in "The Introverts (and Shy Guys and Gals) Guide to Success in Science and Leadership." Judy advises introverts to accept that they are indeed introverts and that they too can be extremely successful in any career they choose! A must-see talk for any introvert! ACS Webinar, August 2, 2012. Joseph Steig moderates. "You have a great idea and great science, now you need to build a company. Learn about the kind of structures they didn’t teach you in chemistry class!" Fireside Chat – How Green Is Your Company… and How Do You Tell Your Story? ACS Webinar, July 19, 2012. Judy Giordan moderates. "Inorganics? Gas Phase? Semiconductors? Going green is more than algae and wind. Inorganics, Gas Phase, Semiconductors are all examples of green in chemistry. But how do you tell your story and sell your green ideas?" Startup Support – Who Provides What and At What Terms or Qualifications? ACS Webinar, June 7, 2012. Joseph Steig moderates. "You need lab space, employees, a sales team, legal advice, and business strategists. Oh yeah… you needed them yesterday. Learn what resources, other than funding, are needed by and available to help entrepreneurs. Join in this eye-opening discussion with Dean Chang, MTech and Gus Weber, Polaris Ventures." Where to Take My Career - A Start-Up or an Established Company? CSMC Webinar, May 17, 2012. Judy Giordan moderates. Entering the workforce is a major concern for graduate students nationwide. Researchers reaching the end of their graduate education are confronted with fundamental questions of how best to continue their careers into technological industry. Should one attempt to start or join a small company based upon his/her research, or should one join the ranks of a large, multinational corporation with well-established practices and partnerships? What are the benefits of each approach to furthering a burgeoning career? What should graduating researchers consider about their own personal goals and interests before pursuing a career in either a large company or a startup? Listen to Judy and distinguished panelists Dr. Stephen Meyers, Lead Engineer at Inpria Corporation, and Dr. Alicyn Rhoades, Industrial Marketing Manager for Thermoplastic Urethanes, at Bayer MaterialScience, LLC (BMS), take live audience questions on factors that influenced their early career choices. ACS Webinar, May 3, 2012. Judy Giordan moderates, Joseph Steig as speaker. "The market and need for biobased materials for everything from chemical feedstock to full composite reinforcement material is growing every day! How is this supply chain defined? What are the forces governing it? And what are the challenges facing those technologies that need to scale using biobased materials? Find out the answers from our speakers Sharon Feng, Bayer Material Science and Joseph Steig, Natural Composites, Inc."
ACS Webinar, April 5, 2012. Judy Giordan moderates. "Risks and rewards; learn what it takes to be part of the startup culture! Gain insights with Heidi Friedman, Boston Heart Diagnostics, and Dr. Chris Palatucci, Palatucci Executive Search, LLC." CSMC Webinar, February 2, 2012. Judy Giordan moderates. The basis for most ventures based on discoveries in science and engineering is their inventions—their intellectual property. And the importance of protecting intellectual property—these all important intangible assets—in an appropriate way becomes a key factor in the ability of any researcher to realize the translation of their research to a marketable product or service! But how can research be protected? What are the options for protecting your intellectual property? What is the role of the Tech Transfer office in protecting and commercializing university IP? What are the roles of students, post docs and professors in this protection process? What are the similarities and differences in protecting intellectual property for new materials and their uses from other types of inventions? Listen to Judy and distinguished panelists Dr. Mary Foley-Phillips, Associate Director - Intellectual Property and Licensing, Oregon State University, and Mr. Stacey Slater, Partner, Klarquist Sparkman, LLP, take live audience questions on translating university research into market oriented innovations! ACS Webinar, October 20, 2011. Joseph Steig moderates. "You may have a great idea, but how do you persuade investors to sustain funding all the way from development to market? Raising capital is among the most fundamental of all business activities, yet it is one of the least understood by scientists. Get valuable inside perspectives on what investors look for and learn the keys to building a high growth venture! Join our speakers, Joseph Steig, Director of VentureWell at NCIIA, and Dr. Stephen Flaim, President of San Diego Tech Coast Angels, as they reveal the “art” in startups!" ACS Webinar, July 21, 2011. Judy Giordan moderates. "Many businesses fail because they are late to recognize key changes in the technology and market landscape. How can you make sure your business, products, and services remain relevant to your customers? Join our speakers Pamela Roach and Elaine Harris, of Breakthrough Marketing Technology, as they share tangible strategies that can help you stay competitive and grow your business!" Is Being an Innovator-Entrepreneur Your Cup of Tea? ACS Webinar, April 21, 2011. Judy Giordan as speaker. "How many revolutionary innovations began with that simple thought, “I wonder if…”. Have you had an idea, but weren’t sure if it would fly? It takes science, business, and stamina to take on the high-risk but high-reward challenge of being an entrepreneur. Judy Giordan walks you through the initial steps of becoming a successful entrepreneur – from idea to realization."